Three International Space Station crew members are scheduled to leave the orbiting laboratory on Wednesday 11 March after almost six months in space performing scientific research and technology demonstrations. Expedition 42 Commander Barry Wilmore of NASA handed over command of the International Space Station to NASA astronaut Terry Virts early this afternoon, marking the start of Expedition 43. Wilmore will return to Earth 11 March in the Soyuz TMA-14M spacecraft with Russian cosmonauts Alexander Samokutyaev and Elena Serova, wrapping up almost six months in orbit. 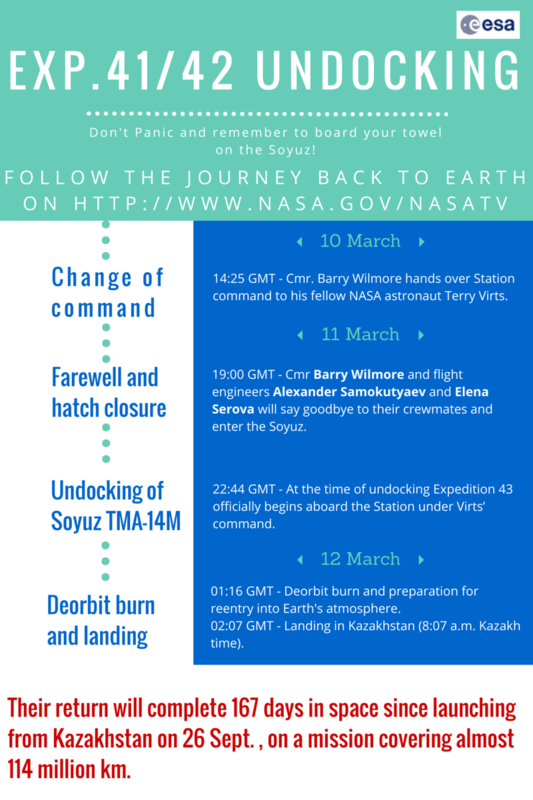 Here is the schedule to follow their return to Earth.